With Adam’s ongoing training, his next project was to look at NFC tags. We bet you are wondering what they are? 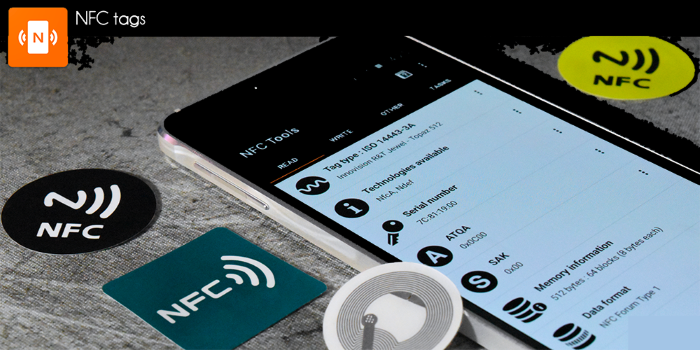 NFC stands for Near Field Communication and these chips have a multitude of uses in mobile phones as well as in other areas. NFC tags are generally used to create local wireless links for data transfer, i.e. if you use Apple Pay, Android Pay or even a contactless credit or debit card, you will use this type of technology every time you pay for something. As the chip’s range is usually small, the other device which it is linking with, needs to be close. Some of the major stores are now using these tags in their loyalty cards to improve the customer experience and they have been used by event organisers in wristbands which have been issued to festival goers. The advantage of this is that it doesn’t need to pair with the other device as with Bluetooth transfers and it doesn’t use much power to operate too. How did Adam use NFC tags for our client? Adam researched the current uses for near field technology and found out that they come in many different shapes and sizes. He also learned how to program them; they can be configured to open apps, social media, emails, video, send automated text or one of a long list of other uses which makes them ideal for loads of different applications. One of our clients had expressed an interest in NFC tags, and how they could help their business. This client has a kitchen showroom and to improve the service which they offer to their potential customers, they wanted to see if they could make it easier to show what they can achieve with their designs. Adam asked them to send over details of all of their designs and he used this information to program the NFC tag. The tag will now allow their sales staff to demonstrate to customers the variety of options available via the use of a tablet. They can walk through their showrooms and the tag will pick up the information and send it to the client’s mobile phone or tablet. Contact us to learn more about NFC tags and how they can help your business. Adam will be demonstrating their many uses at our HOT Day (Hands on Technology Day) from 11.30am until 4pm on Wednesday 17th January 2018 at The Birch Hotel, Heywood, OL10 2QD. HOT Day is the opportunity for you to try out new technology in a safe and controlled environment – if you’ve ever wanted to try out a smart monitor, SharePoint services, Cloud-based VoIP communications or biometric ID systems, make sure you come along. Our tech experts will use no-nonsense, no-tech speak and guide you through the different uses of all the systems we have on display. If you want to know about something we haven’t got on display, just ask and we will give you some background information. Hope to see you there!